As the name suggests the design of the Pride Go-Go Elite Scooter has two main features; it can easily be transported without any problems and it can maneuver in very tight spaces. This travel scooter from Pride can be disassembled into five lightweight sections and you can easily take it apart with only one hand. The Go-Go Elite Scooter is very compact weighing less than 100 pounds including the batteries. The heaviest piece weighs only 28 pounds which means nearly anyone will be able to load and unload this travel scooter with little effort. Other features of the Pride Go Go Elite Traveller series include a tight turning radius, a dual braking system and a computer-based controller that optimizes battery power. 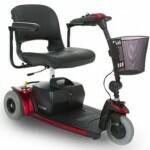 It also has three interchangeable color panels; red, blue and silver so you can change the color of your medical mobility scooter whenever the mood strikes you. The Pride Go Go Elite Traveller Plus is a redesign of the Elite Traveller series that adds increases in length and width for a more stable ride and increases in weight capacity so that more people can take advantage of this great scooter. Additionally, the wrap-around delta tiller handles are great for individuals with larger hands or those who have limited dexterity. There is also an HD version of the Pride Go-Go Elite Scooter which has a greater weight capacity. All three models come in both three-wheeled and four-wheeled versions. So if you are looking for a very lightweight, portable and agile travel scooter the Pride Go-Go Elite Scooter series may be the best option for you. You should consider whether you intend to use your Pride Scooter outdoors and the type of terrain you are likely to encounter. Four-wheeled versions tend to be more stable than their three-wheeled counterparts. This model is available at US Medical Supplies. They are one of the world’s largest suppliers of medical and mobility products with over 10,000 products offered at discount prices. They place a special emphasis on products such as medical mobility scooters because they understand that personal independence is critical to your quality of life. Free shipping is provided as well as a one-year in-home part and service warranty. Extremely helpful info particularly the final phase 🙂 I maintain such information much.